In stock 102 items in stock. Darn, whoever keeps buying them all leave at least 5 left for the rest of us. So, when are you going to get more in stock? When will you get this in stock again? Any expected delivery date? How the crap did these go from instock 800+ qty to out of stock in less than a week? Someone bought all of them, which does happen from time to time. We have a system in place that tries to predict when we'll have zero stock based on normal buying patterns, so that we can place reorders well in advance, but of course unpredictable events can throw all that out the window. We're on it and will get them back in stock as soon as we can. Many thanks for your reply. Do you by chance know of time frame that we could expect for these parts to be back in stock? I checked on that; we do have a shipment on the way, and are expecting them to be on the storefront in the second week of June. You can use the autonotify feature to have us send you an email when they're available, or place a backorder if you want them sent ASAP. Sorry for the inconvenience! Does anyone have a Digi-Key part number for this? 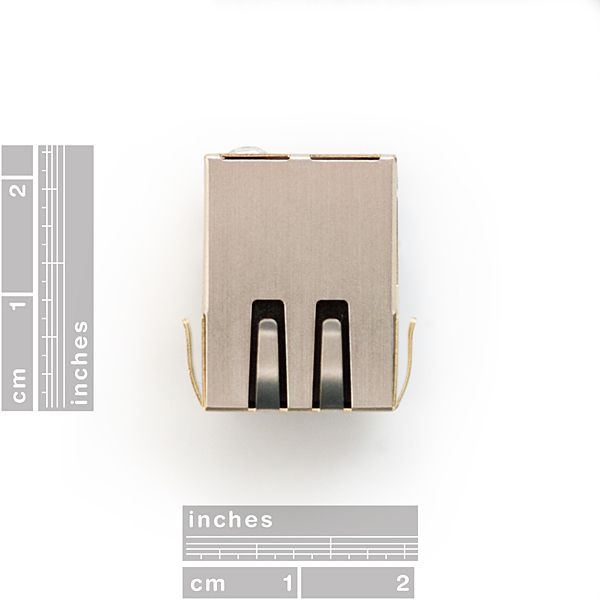 Can anyone please let me know about the mouser part number of the same connector? Did you guys change this part in any way in the last couple of months? I've got a project using the W5100 and this magjack. The ones I got a few months ago work, while the ones I got in a couple of days ago don't. Same exact hardware. Update: the magjack isn't at fault. The problem seems to be an issue with the PCB stencil around the W5100. Does this connector need additional components, like resistors capacitors and a choke inductor? I've seen this components attached to other MagJacks in circuits. 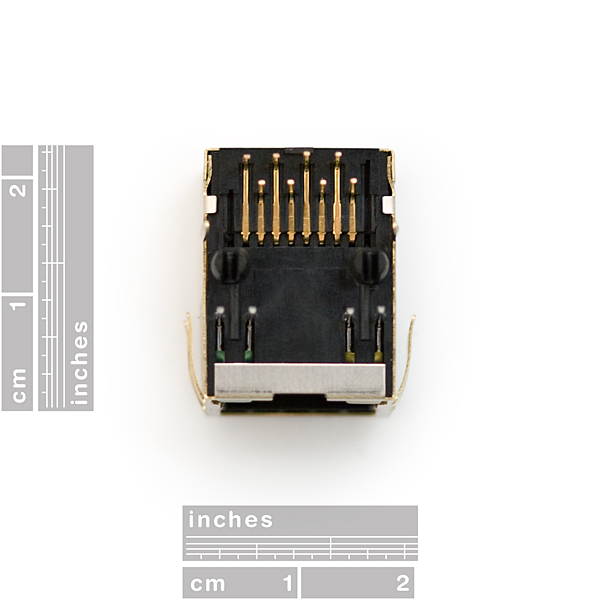 Can any one share a schematic of a ENC28J60 with this connector, please? Yes, you will need some capacitors and resistors. I have a schematic for the ENC424J600 uploaded, so that should hopefully be close to what you'll need for the ENC28J60 right here. Note that R14 and R15 are 49.9 ohms, I forgot to label them in my schematic. We used it to make a breakout board for mbed. See our blog for details and schematic. Lauszus Could you kindly post your schematics with interfacing magjack to the ethernet controller? above given link only indicates magjack pins. The below post by 'tristanseifert' with link here does include 6.8nF series capacitors in RD(rx) pins. is this necessory? or you managed without these series capacitors? also there are differences in center tap connections. Your's seems to be simpler. It will be much helpful if you could post the interfacing schematics with all resistors and capacitors used. Now I understand why 6.8nF series capacitors used in 'tristanseifert' schematic. he is using ENC424J600 and its datasheet specifies to use series capacitors in RD line. It also specify to use a resistance in TD center tap. Does anyone know if this is the ï¿¼ï¿¼ï¿¼J00-0042NL/46NL/64NL/66NL, the J00-0014NL/45NL/61NL/65NL or the J00-0025NL/51NL/62NL/63NL Magjack? They are all wired differently internally, so if anyone's figured this out, please do let me know. A comment did state it was somewhat working with the ENC28J60, while I'll be using the ENC424J600 which shouldn't be too different. Will this work with POE? It should, it's just an RJ-45 jack really. The data sheet shows contacts 4&5 and 7&8 bridged internally. So, this MagJack is incompatible with "Mode B" or "Passive" PoE. It may be possible to use "Mode A" or "Phantom" PoE with this MagJack, but I'm not familiar enough with the implementation details to say for sure. [EDIT] I don't think this jack would work for Mode A / Phantom PoE either, since the center-taps of the TX/RX transformers are grounded. 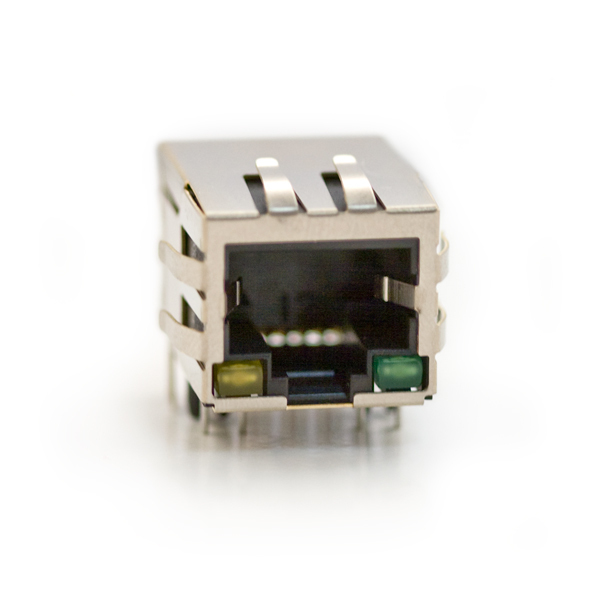 If you want a PoE compliant 10/100Base-T MagJack, check out DigiKey part number 380-1119-ND. could this directly connect to an arduino without other ICs? if so what would the code be? This is just the physical interface to an Ethernet cable; actually using the network requires many other layers of software that would be hard to get running on a bare Arduino. 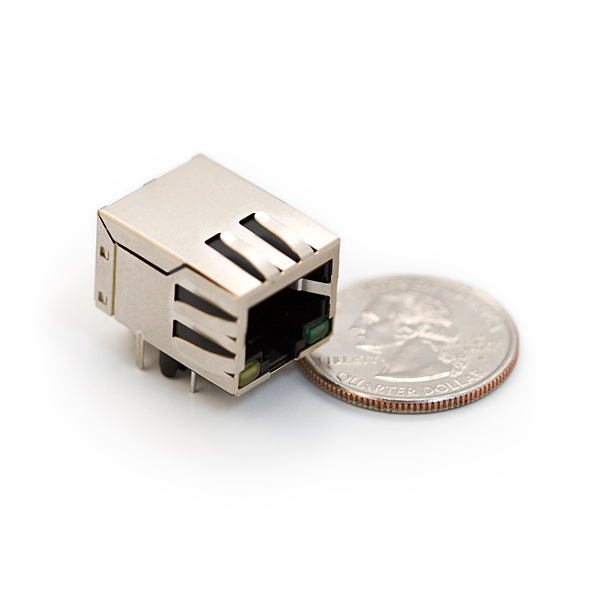 To make your life much easier, take a look at our Ethernet Shield, which includes a chip that does most of the heavy lifting for you. Sick in a good way! Are there any TRUE Magjack or Pulsejack crossreferences? Since the SFE Eagle Library doesn't seem to have this part, I quickly made one up. I hereby place this file into the public domain, Sparkfun or anyone else is free to use it/modify it/whatever for any purpose. I've had boards made up with this footprint and jacks from here, seems fine, but I make no assurances on the quality of the footprint. No, SFE Eagle Library does not have this part! The existing footprint in the library if for the plastic version, which does not have side pegs, and does not have LEDs. It's missing the LED pads! But it is 10 Base-T or 100 Base-T? I think the speed is decided by the NIC. There are some other model #'s listed in the datasheet as only supporting 10BT. The model I refer to in the post above relates to an item that was not purchased at Sparkfun. It does hwoever seem to indicate that there are versions of MagJacks/PulseJacks that support 100BT and/or 10BT.